FORBIDDEN! You laugh at the sound of the word! After all, you’ve heard it before…and survived! This time, there’s not even a sinking island. What could go wrong? Flying deep into the heart of the desert, your team searches for a fabled city of advanced knowledge, great wealth, and unimagined wonders. But the expedition goes awry quickly as you crash land amongst the buried ruins. To escape, you must dig through the city and discover its ancient secrets before sun and sand entomb you with storms of time. 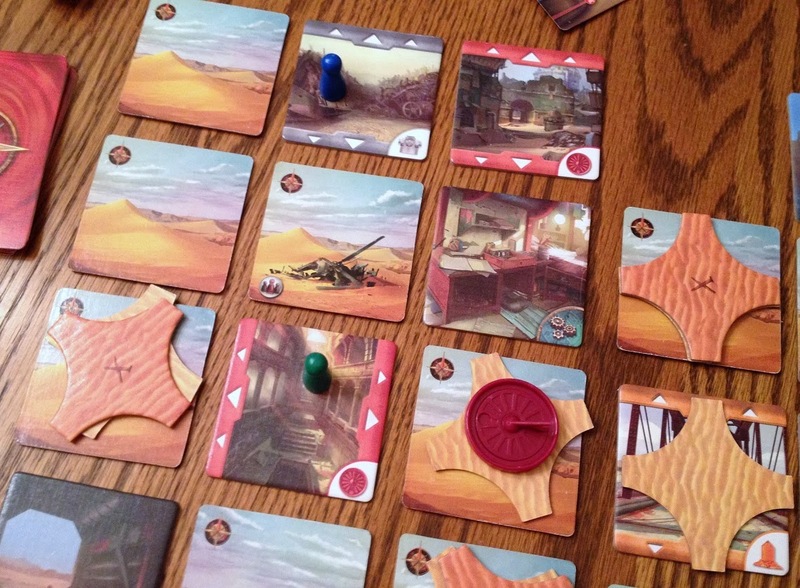 Forbidden Desert is a cooperative game where all players work together. Having wrecked amidst the remains of a lost civilization, your team must find parts in which to reconstruct an ancient airship for escape from the inhospitable ruins. Alas, time is not on your side! The “game board” is comprised of twenty-four, face-down land tiles in a 5×5 grid. The epicenter remains empty – this is the eye of the sandstorm. The backs of three tiles have a water droplet – two of which will be a well, the third a useless mirage – and one tile has the rubble of your ill-fated aircraft on which your pawns begin. Each individual is assigned a role (either randomly or by mutual consent) which grants him/her a special ability that should prove helpful during play. Turns proceed in two simple phases, but are packed with lots of angst, which grows more intense as the game progresses. 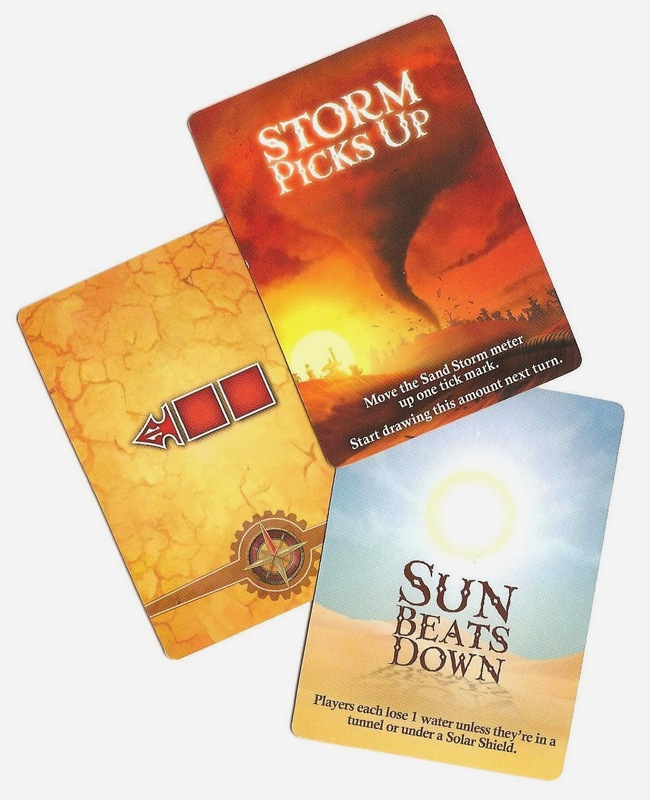 To handle the game’s “archeological” exploits during the first phase, ForbiddenDesert uses an action point allowance mechanic whereby players can perform up to four actions on their turn from a list of select options. For one action point, they can move one tile up, down, or sideways. They can clear sand from a location, one marker per point. They may elect to excavate a cleared tile, thus flipping it over and discovering what’s buried beneath. It also costs a point to collect an airship part once revealed and another to use a role’s unique characteristic. Once flipped, land tiles uncover some interesting goodies. Many are lost, advanced technical gadgets that your team can use to help survive the ordeal. Others provide clues to the airship. You need to find four parts and each has two associated tiles that, once discovered, provide coordinates in which to locate and collect its corresponding piece. And two tiles unearth wells which will soon prove essential to your band’s survival. The second phase provides most of the game’s tension, as well as its neatest mechanic. This is where you draw storm cards – a number equal to the storm’s intensity level, which is marked on a separate track (between 2-5). Most of the cards indicate the direction and breadth in which the storm travels. As it moves, the ferocious winds shift land tiles around and deposit a layer of sand on those it passes over. A tile with two or more sand markers is impassable until cleared of all but at least one; nor can it be excavated until swept completely. A few cards force players to drink water, unless they have some way to beat the heat. The amount of water you have is tracked on your personal role card. When it’s completely depleted, you perish. Finally, some cards indicate that the storm’s intensity increases, meaning you’ll likely be drawing more cards. There is only one way to win: find and gather the airship’s four parts and get the team back to the cleared launch pad. However, there are three ways to lose. If one team member runs out of water, the game ends. If you run out of sand markers, then your party is simply overwhelmed. Likewise, if the storm’s intensity level reaches the maximum height on the track, everyone succumbs to its ferocity. In any event, your group perishes and you all sleep with the Pharaohs. Playing ForbiddenDesert reminds me of the Jimmy Stewart drama, Flight of the Phoenix(1965). While the initial premises behind the desert crashes are different, the solutions and challenges are eerily similar. To survive, the disparate castaways must reconstruct a working aircraft from old parts while enduring fierce sandstorms and a dwindling supply of water. At least, hopefully you and your fellow board game players can avoid the movie’s infighting, back-stabbing, tragic deaths, and marauding raiders! Like its predecessor and model,ForbiddenDesert has a clean, straight-forward action selection mechanic. The available options give players choices, but do not overburden them. It is intuitive, easy to learn, and very accessible. The use of the sandstorm meter, flipping of tiles, and accumulating sand markers visually expresses the team’s progress – and the escalating obstacles to overcome. You see, this design ratchets up the intensity. A lot! ‘X’ marks the spot! Once you discover the red tiles, cross-reference them to locate the ship’s, um, sundial, I guess? 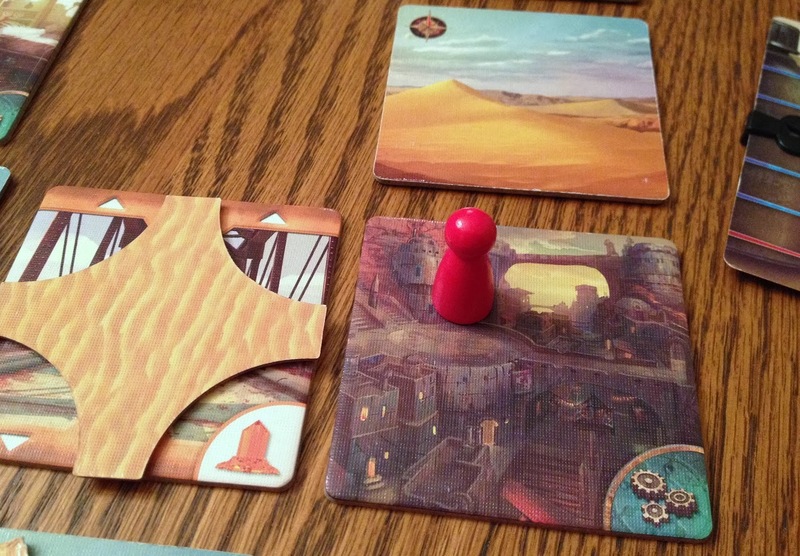 Forbidden Desert is much more challenging than its island cousin. For one, the sandstorm threat is more threatening and unpredictable than the original’s flooding mechanic. You never know which way the winds will blow and often they swirl back and forth intensifying its effects. That leads to the second greater impediment. Whereas shoring up a tile in the first game cost one point to flip a tile back to normal, here you may have to clear multiple sand makers off the same location – at a cost of one action per marker! And time is not a luxury in this adventure. Finally, while ForbiddenDesertalso includes very helpful objects that you can discover, you only get to use each of them once. The items deck is never recycled. The increased difficulty places more importance on the individual roles and their unique abilities. While these roles give the game character and replayability, a couple of their associated powers are more helpful than others. The Water Carrier can continue to draw water from excavated wells and then give water to other players. Otherwise, there are only three ways to refill your canteen – by excavating two wells and through the use of a gadget. In both cases, a team member must be present at the same location on which the action is resolved in order to benefit. This is often a cumbersome chore to organize that can waste valuable time. A few ancient gadgets you might find helpful. They really built things to last back then – just like 1950s America! The Meteorologist is the second near-essential role. This player can save action points to deduct from the number of storm cards drawn at the end of a turn. Less cards equals less bad things happening. Of course, the trade off is that he/she will be able to do fewer things. But many times it’s worth it, especially in the early game to hamper the storm and prevent it from escalating too quickly. And believe me, as the storm escalates, the chaos abounds. Short of memorizing and keeping track of the directional cards, you have little chance of predicting the storm’s progress, and zero shot of controlling it. Thankfully, there are a couple of respites from the tempest. Logically, the eye of the storm can never leave the board. Therefore, if you draw a card that would send it off in such a direction, you ignore it and gain a reprieve as the squall subsides a bit. Also, as tiles are excavated and revealed, many of them become irrelevant so that you can afford to allow sand to pile up on those locations. Although you must still be careful not to block your team’s mobility too much, as tiles with two or more sand markers are impassable. In spite of this random turmoil, or perhaps because of it, ForbiddenDesert poses a nice logic puzzle that stresses teamwork. 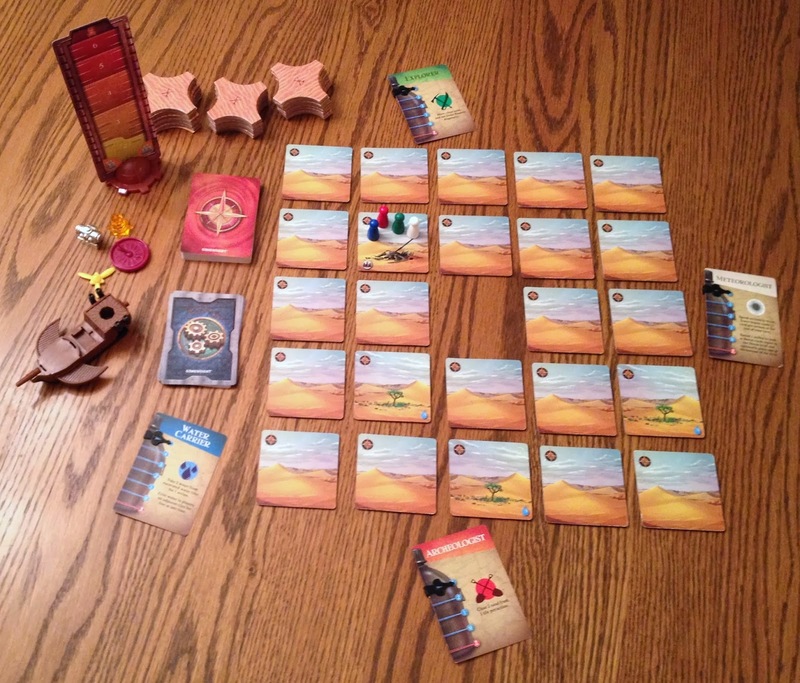 Whereas ForbiddenIsland’s primary cooperative element is basically trading treasure cards, team management in ForbiddenDesert is much more important in order to clear sand, excavate, and acquire water. As the storm can deposit several layers of sand on a single location, one individual simply doesn’t have enough time to move, clear multiple sand markers, and excavate all in one turn. You’ll need to work together. Overall, it’s a reactionary exercise thanks to the storm’s haphazard nature. But organizing a well-executed plan based on who is where, with what gadgets, and which abilities they posses to accomplish what you need is rewarding. The title is a true cooperative design. While a great component of the game, the storm mechanic also brings a little baggage. It is extremely fiddly. Every turn you slide tiles back and forth, up and down. Then you lay markers on those locations that shift – light side up for the first layer, dark side up for each additional stratum. Then you remove some as you clear sand, likely to just mark it again at the end of your turn. With a healthy steampunk flavor – the location tiles have attitude. Also, it’s slightly unintuitive and takes several rounds before you’re comfortable with how the storm moves. The storm cards have a simple icon that is a number of tiles and a directional arrow. The rules state to shift that many tiles in the direction indicated – thus the empty space, or eye of the storm, migrates the opposite way. However, we kept shifting the eye of the storm the number of spots indicated on the card and slid the tiles back the opposite way. It just seemed more natural to us…perhaps we’re strange? I guess as long as you’re consistent, either method works just as well. 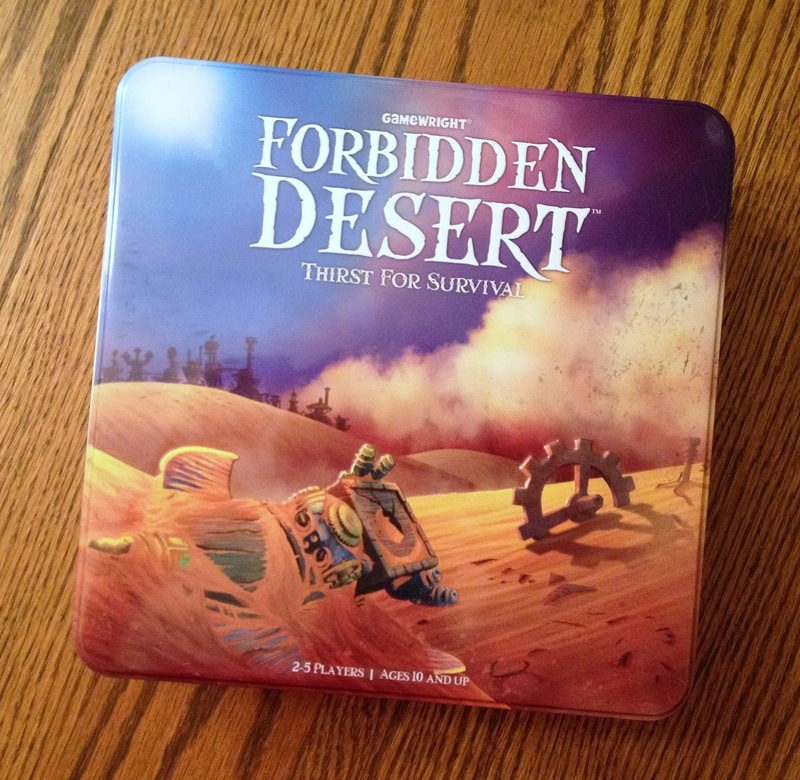 No surprise for a Gamewright title, ForbiddenDesert is a quality product. Cards are slick and sturdy. The tiles are thick and chunky. The storm’s intensity is tracked on a separate, double-sided board scaled to the number of players. There will be slightly higher than average wear on the edges of the storm level track and individual role cards (to track water) due to applying and sliding the plastic indicator tabs. The artwork is superb with a great steampunk flavor. However, the airship is the pièce de résistance. The four parts you must acquire are tangible, 3D resin – or in the engine’s case, metal – pieces. More than that, there is actually a larger, plastic airship model on which to place them! It is completely gratuitous, but really enhances the game’s sense of adventure. Perhaps the biggest question on your mind is, “If I have Forbidden Island, should I really get Forbidden Desert?” Unless you just don’t have much of an opportunity at all to play cooperative games, I would answer, “Yes.” While the action allowance mechanics are essentially identical and the gist of both feel the same, Desert is nonetheless more interesting because of its difficulty and the resultant emphasis that places upon individual roles. If you don’t have either title and want only one, I would highly recommend ForbiddenDesert. It’s just as accessible as ForbiddenIsland, yet is more fun and challenging. 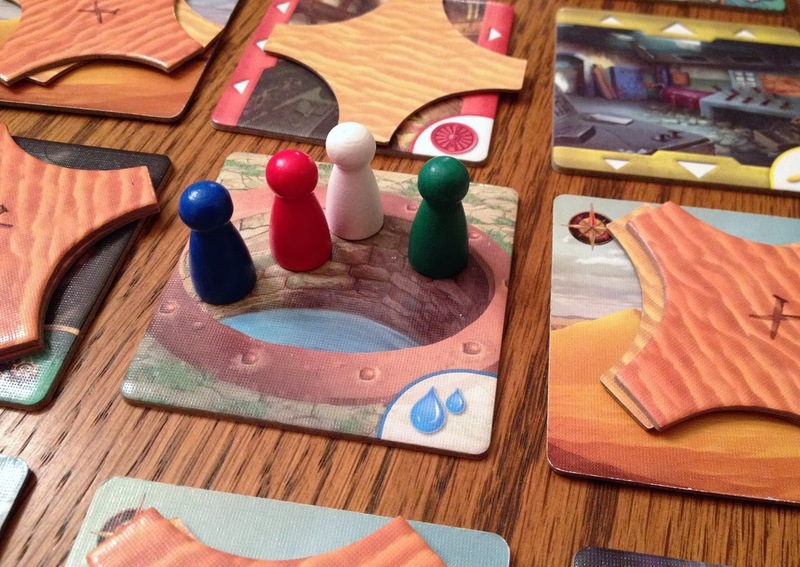 That broadens the appeal and makes ForbiddenDesert a great bridge between experienced and casual/family gamers. 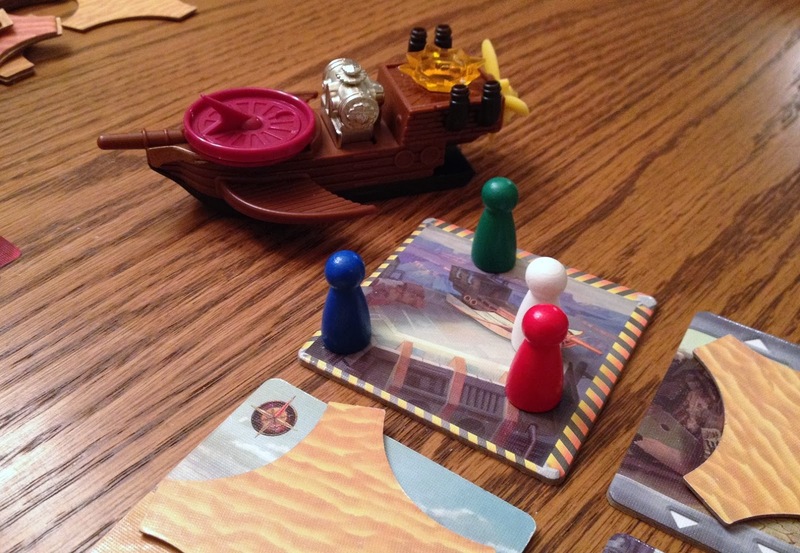 iSlaytheDragon would like to thank Gamewright for providing a review copy of Forbidden Desert.